walled plain Older term, still used by some lunar observers, for large lunar CRATERS. Walter Ancient lunar crater (33°S 1°E), 129 km (80 mi) in diameter. Its walls are deeply incised from later impacts, to the point that they have been eroded away to the north and south. The ejecta have also been removed by impact erosion. While the floor appears to contain peaks to the north-east, these are mostly crater rims that have merged because of the proximity of the impacts. Wargentin Lunar crater (50°S 60°W), 89 km (55 mi) in diameter. It was originally a complex crater with central peaks, wall terracing and an ejecta blanket. After its formation, however, lunar basalts flooded the interior, covering the central peaks and the inner wall structures. Indeed, the lava level is higher than the surrounding lunar surface. The ejecta blanket has been eroded away by meteorite erosion. Warner & Swasey Co. Machine-tool company based in Cleveland, Ohio, that made several large telescopes for major observatories in the late 1800s and early 1900s. Worcester Reed Warner (1846-1929) was a machinist from Massachusetts who had an interest in astronomy; in 1880 he opened a factory in Chicago with Ambrose Swasey (1846-1937), a mechanical engineer from New Hampshire. After a year, they relocated their operations to Cleveland, where there were more skilled machinists, and the business prospered. Warner & Swasey's first telescope was a 9 \-inch (240-mm) refractor sold to Beloit College, Wisconsin, with a lens by ALVAN CLARK & SONS. Buoyed by this success, the firm began making larger German equatorial mountings. Large, sturdy mountings of this type were necessary to support the large refracting telescopes favoured by major observatories in the late 19th century. Warner & Swasey were the first telescope-makers to approach telescope design as a total engineering problem, and their highly accurate equatorial drives gained them renown. One of their innovations was to replace the tangle of ropes and chains used to control the long tube assemblies with a more elegant and efficient system of rods and gear trains controlled from the eyepiece end of the telescope. By 1886 Warner & Swasey had completed LICK OBSERVATORY'S 36-inch (0.9-m) refracting telescope which, with another Clark lens, was then the world's largest. They topped this achievement with the 40-inch (1-m) refractor installed at YERKES OBSERVATORY (1893). From 1885 to 1915 John BRASHEAR supplied most of the lenses for the firm's telescopes. Water Jar Y-shaped asterism in Aquarius, formed by 7, Ј, t) and tt Aquarii. It represents the jar from which Aquarius is visualized to be pouring water. wave mechanics Equations formulated by the French physicist Louis Victor de Broglie (1892-1987) and the Austrian physicist Erwin Schrodinger (1887-1961) to describe the wave structure of atomic particles. Wave mechanics is completely contained within the more general structure of QUANTUM MECHANICS. weakly interacting massive particle (WIMP) Particle postulated to make up the missing mass in galaxies and clusters of galaxies. These hypothetical particles would rarely interact with ordinary matter, hence the description 'weakly interacting', and would have masses 10 to 10,000 times the mass of a proton. These types of particles are suggested by certain theories of ELEMENTARY PARTICLES but have never been experimentally detected. Webb Society International society of amateur and professional astronomers who specialize in observing double stars and deep-sky objects (DSOs), founded in 1967 and named in honour of the 19th-century amateur observer the Reverend T.W. WEBB. The Webb Society publishes a quarterlyjournal, Deep Sky Observer, and specialist observing guides for various categories of DSO. Webb, Thomas William (1807-85) English clergyman whose Celestial Objects for Common Telescopes (1859) did much to popularize amateur astronomy in Britain. His book was based on 25 years of observing planets and variable and binary stars with a 3.7-inch refractor, though after 1864 he began to popularize the new silver-on-glass reflecting telescopes of George Henry With (1827-1904). Webb was pre-eminently an observer, not concerned with making scientific discoveries,just wishing to enjoy the beauty of the night sky. He inspired many to do likewise, and is therefore one of the founders of modern amateur astronomy. wedge Adjustable, angled platform placed under a FORK MOUNTING to adjust it to the local latitude. Many modern SCHMIDT-CASSEGRAIN TELESCOPES are equipped with computer-controlled drives allowing them to be used without a wedge for visual purposes, or with a wedge for ASTROPHOTOGRAPHY. The wedge is required to create a true EQUATORIAL MOUNTING and eliminate FIELD ROTATION. Weizsacker, Carl Friedrich von (1912- ) German theoretical physicist and astrophysicist known for his theories of stellar energy generation and the formation of the Solar System. In 1938 he proposed, independently of Hans BETHE, that stars generate energy in their extremely hot cores via the successive fusion of nuclei of hydrogen, helium and carbon. Weizsacker calculated how much energy each reaction would produce. In 1944 he proposed a theory of the formation of the Solar System, a variant of Pierre-Simon de LAPLACE's NEBULAR HYPOTHESIS. In Weizsacker's COSMOGONY, vortices develop in a disk of condensing gas and dust surrounding the primordial Sun, triggering the formation of bodies by accretion. West, Comet (C/1975 V1) Long-period comet, the brightest of the 1970s, discovered photographically by Richard West (1941- ) in 1975 November. Comet West became a bright morning object in 1976 February and March. Perihelion, 0.20 AU from the Sun, was reached on 1976 February 25. The nucleus broke into four fragments soon afterwards. Comet West reached a peak brightness of mag. — 1, and showed a prominent fan-shaped dust tail 25-30° long. The orbital period is of the order of 500,000 years, and it is likely that the individual nuclear fragments will each make their returns well separated from the others. Westerbork Synthesis Radio Telescope (WSRT) Major radio telescope array near the village of Westerbork in the north-east of the Netherlands, operated by the Netherlands Foundation for Research in Astronomy. Completed in 1970, it consists of 14 antennae 25 m (82 ft) in diameter arranged along a 2.7-km (1.7-mi) east-west baseline. Ten of the antennae are fixed in position, while the remaining four can be moved along rail tracks to synthesize a telescope up to 2.7 km in aperture. Wezen The star 8 Canis Majoris, visual mag. 1.84. It is a white supergiant of spectral type F8 Ia with a luminosity around 50,000 times that of the Sun, lying some 1800 l.y. away. The name comes from the Arabic wazn, meaning 'weight', the significance of which is unknown. Whirlpool Galaxy The magnificent Whirlpool Galaxy (M51, NGC 5194) takes its name from its pronounced spiral structure. The small companion galaxy at left, NGC 5195, appears to be interacting with the Whirlpool. Whipple, Fred Lawrence (1906- ) American planetary scientist who devised the 'dirty snowball' picture of cometary structure. He spent most of his scientific life at Harvard, where he directed the SMITHSONIAN ASTROPHYSICAL OBSERVATORY (1955-73). In the 1930s, his photographic studies of meteor paths provided evidence that meteor showers occur when swarms of debris left behind by comets intersect the Earth's orbit. Whipple's comet model (1949) described them as large aggregates of ices and silicate debris; when the comet nears the Sun and is heated, sublimating ices are ejected in jets along with silicates, generating the comet's dust tail. He showed that these jets, confirmed by 1986 spacecraft studies of Comet HALLEY, can affect the comet's orbital motions. The FRED L. WHIPPLE OBSERVATORY is named in his honour. Whirlpool Galaxy (M51, NGC 5194) Face-on spiral galaxy in the constellation Canes Venatici (RA 13h 29m.9 dec. +47°12'), with apparent magnitude +8.4 and angular diameter 11'X 7'. Discovered by Charles MESSIER in 1773, the Whirlpool Galaxy takes its name from drawings and descriptions made in 1845 by Lord Rosse, who saw its prominent spiral arms through his 72-inch (1.8-m) reflector. M51 appears to be interacting with a smaller companion galaxy, NGC 5195. It is the most prominent member of a small group that lies 37 million l.y. away. whistler Effect that occurs when a plasma disturbance, caused by a lightning stroke, travels out along lines of magnetic force of the Earth's magnetic field and is reflected back to its point of origin. The disturbance may be picked up electromagnetically and when converted to sound gives the characteristic drawn-out descending pitch of the whistler. This is a dispersion effect caused by the greater velocity of the higher-frequency components of the disturbance. The reflections from ionized meteor trails (see RADAR ASTRONOMY) can be observed as a 'whistler' in a receiver tuned to a distant transmitting station. Here the whistler is an interference beat between the ground wave from the transmitter and the wave reflected from the ionized meteor trail. white dwarf Evolved STAR with mass similar to the Sun but with a radius only about as large as that of the Earth. White dwarfs are composed of DEGENERATE MATTER and are supported by electron degeneracy pressure. The density of the matter from which they are made is enormously greater than that of any terrestrial material: one cubic centimetre of white dwarf matter weighs approximately one tonne. white dwarf This close-up view from the Hubble Space Telescope shows part of the globular cluster M4 in Scorpius. 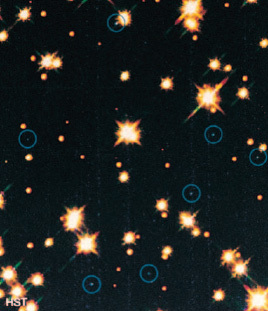 While most of the objects seen here are old, red stars, several white dwarfs (circled in blue) have also been found. The first white dwarf to be discovered was the companion of Sirius, now called SIRIUS B. In 1844 Friedrich BESSEL discovered irregularities in the motion of Sirius, and concluded that it must have a companion, the pair forming a BINARY SYSTEM with a period of about 50 years. In order for its gravity to swing Sirius around in its orbit, it was clear that the companion must have a comparable mass (quantitative analyses using Kepler's third law for the binary orbit giving a mass between 75% and 95% of the Sun's mass), and yet it must be very faint to have remained undetected by direct observation. In 1862 ALVAN CLARK and his son Alvan Graham Clark discovered a very faint star close to Sirius, which was subsequently identified as the elusive companion. As the distance to the system was known, this allowed the companion's luminosity to be estimated as only about 1/360 of that of the Sun. In 1914 W.S. ADAMS made the surprising discovery that Sirius B had the spectrum of a 'white' star, with a surface temperature about two and a half to three times that of the Sun. The total radiation from the surface of a hot body rises as the fourth power of its temperature, so that each square centimetre of Sirius B's surface should radiate between thirty and eighty times as much as the Sun. The only way to reconcile this with the very low total luminosity inferred above was to conclude that the radius of Sirius B was far smaller than that of any star known at the time. The result remained uncertain until in 1925 Adams succeeded in detecting the gravitational redshifts of several absorption lines in the spectrum of Sirius B. This general relativistic effect depends on the ratio of the star's mass to its radius. As the mass was already known from the properties of the orbit, Adams was able to find the radius of the star in an independent way, giving an estimate consistent with his earlier result. It was very quickly realized that their enormous matter densities make white dwarfs fundamentally different in nature from 'normal' stars. In a star like the Sun, it is the thermal pressure of the gas and radiation of the star that prevents it simply collapsing under its own weight. As early as 1926, the British astronomer Ralph Howard Fowler (1889-1944) showed that this cannot be the case for white dwarfs. Instead, the pressure required to hold up these stars against their own gravity is provided by a fundamental quantum-mechanical effect which had been discovered only months before by US physicist Enrico Fermi (1901-54) and British physicist Paul Dirac (1902-84). As in most stars, the matter inside a white dwarf is almost completely ionized, that is, the electrons have all been ripped off their parent atoms (here because of the frequent collisions between atoms) leaving the matter as a mixture of free electrons and nuclei. What Fermi and Dirac had discovered is that there is a fundamental limit to how close together two electrons can be pushed. Electrons resist being in the same place with the same speeds: push them closer together and they will react by moving faster. This motion amounts to a pressure, called degeneracy pressure: it differs from ordinary thermal pressure in depending only on the density of the constituent particles, rather than on the product of the density and the gas temperature. The larger the mass of a star supported by degeneracy pressure, the faster the electrons inside it must move, until ultimately, for stars of masses only slightly greater than that of the Sun, they are moving with speeds close to that of light. The theory of relativity forbids motions faster than light, so that relativistic corrections must be made to the degeneracy pressure for such stars. The pressure is then found to increase rather less rapidly with the density. In 1931 Subrahmanyan chandrasekhar computed the structure of a white dwarf with these relativistic effects included. He made the discovery that a white dwarf cannot have a mass more than about 1.4 times the Sun's mass (see chandrasekhar limit). For larger masses, gravity would always overwhelm the pressure forces and the star would collapse under its own weight. Stars with initial masses ranging from about 0.08 to about 8 solar masses (over 95% of the stars of our Galaxy) will eventually end up as white dwarfs. All stars lose energy into space by radiation. In response to this constant drain of energy, the central parts of the star gently sink closer together during huge expanses of time, becoming denser and more tightly bound by their mutual gravitational attraction. If the star is supported in the normal way by thermal pressure, it has to become hotter in order to supply the increased pressure demanded by the stronger gravity. Thus in response to the loss of energy by radiation from its surface, the star has actually had to become hotter. This means that radiation losses from its surface will continue, driving the evolution to more tightly bound and hotter configurations ever onwards: the star cannot simply cool down and stop evolving. In the white dwarf state, however, we have seen that the supporting degeneracy pressure is independent of the temperature of the stellar material: the star can now radiate all its thermal energy into space without any consequences for its internal structure, and the evolution of the star ends with it quietly cooling down to a cold, dark, inert configuration known as a black dwarf. In practice the star will by then consist entirely of helium and heavier elements, its original hydrogen having been transmuted in the course of its earlier evolution. The existence of the Chandrasekhar limiting mass means that this endpoint is not available to all stars, but only to those whose mass is below the limit when they reach the white dwarf state. It is now known that more massive stars must end their evolution either as neutron stars or black holes. Neutron stars are also supported by degeneracy pressure, but of neutrons rather than electrons; for them, too, there is a maximum mass, although its precise value is less certain than for white dwarfs. 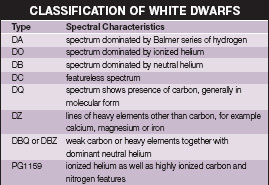 Many white dwarfs are now known, and their observed properties are in good accord with theoretical predictions. Much interest now centres on white dwarfs in binary systems, particularly those that are close enough for gas to be pulled off the companion star on to the white dwarf. Such systems are called cataclysmic variables and include novae and dwarf novae. Evidence also suggests that a very old, faint population of white dwarfs exists in the halo of our Galaxy. white hole Inverse evaporating black hole. Although nothing can escape a black hole's gravity, a black hole actually has a temperature and particles can tunnel out of it. The temperature and emission of particles and energy by a black hole depend on the inverse of the temperature of the black hole; low-mass black holes emit particles at a higher rate than high-mass black holes. A white hole is the final moments of evaporation of a black hole when information and matter emerge from the hole in an unpredictable fashion. where Xmax is the wavelength of the peak emission, and T is the temperature. As a consequence of the operation of Wien's law, cool stars appear reddish in colour, medium temperature stars like the Sun are yellow-white, while hot stars appear blue-white. Wild Duck Cluster (M11, NGC 6705) Rich open star cluster in the constellation Scutum (RA 18h 51m.1 dec. — 06°16'); it was originally discovered by Gottfried Kirch (see kirch family) in 1681. The popular name comes from a description by the 19th-century English astronomer W.H. smyth of the V-shaped cluster as resembling a flight of ducks. The cluster is compact, with apparent diameter 13'. Its stars are fairly uniform in magnitude, with the exception of a single brighter member near the eastern tip. M11 has overall magnitude + 5.8. It lies 6200 l.y. away, and has an estimated age of 250 million years. Wildt, Rupert (1905-76) German-American astrophysicist and planetary scientist known for his accurate models of the giant planets and stellar atmospheres. He was the first (1931) to correctly ascribe absorption lines in the spectra of Jupiter and Saturn to methane and ammonia in their atmospheres. In Wildt's models of the gas giants, a small rocky core was surrounded by ice and shrouded in a deep, hydrogen-rich atmosphere. In 1939 he explained the 'missing opacity' of the solar atmosphere by showing that hydrogen ions slow the radiative flow of energy from the interior, making the outer layers more transparent. Wilhelm Forster Observatory Public observatory in Berlin, dating back to 1889. Its first astronomer, Friedrich Simon Archenhold (1861-1939), was also director of the nearby treptow observatory. Originally called the Urania Observatory, the institution was renamed in 1953 and moved to its present building in 1963. Its telescopes include the 0.31-m (12-in.) Bamberg Refractor of 1889 and a 0.75-m (30-in.) reflector added in the late 1980s. Wilkins, John (1614-72) English churchman and writer who helped to found the Royal Society. He was probably the first writer to explore the ideas of Galileo and Kepler for an English readership. In Discovery of a World in the Moone (1638) he speculated on the Moon's structure and discussed the design of a machine that could fly there. William Herschel Telescope (WHT) Optical telescope with a mirror 4.2 m (165 in.) in diameter, the largest of the three Anglo-Dutch telescopes of the isaac newton group at roquede los muchachos observatory in La Palma. Opened in 1986, the WHT was the last telescope to be built by the firm of grubb, parsons & co., which closed down once it was delivered. The WHT's mounting allows it to be switched between prime, cassegrain and nasmyth foci, and there is a comprehensive instrument suite taking advantage of this versatility. High-dispersion and multi-object spectroscopy can be carried out with the Utrecht Echelle Spectrograph and the WYFFOS spectrograph respectively, while there is also a prime-focus imaging camera. William Herschel Telescope Located on La Palma, the William Herschel Telescope is one of the Isaac Newton Group of instruments. The telescope, a 4.2 m (163 in.) reflector, is the largest in Europe. Wilson, Alexander (1714-86) Scottish scientist who made pioneering solar observations. Over many years, he carefully observed sunspots and their shapes. In 1769 he noticed the changed appearance in a spot's penumbra when a spot is near the limb, now known as the wilson effect, which he attributed to the fact that sunspots are depressions in the solar surface. Wilson published his cosmological theories in Thoughts on General Gravitation (1770), proposing that the entire Universe rotates about a discrete central point. Wilson effect Roughly circular sunspot that appears elliptical when seen foreshortened near the limb. The umbra appears displaced towards the Sun's centre, while the penumbra nearer the limb appears wider than that towards the solar centre, suggesting that sunspots are bowl-shaped depressions. The phenomenon was discovered by the Scottish astronomer Alexander wilson in the 18th century. Wind Satellite in the international solar terrestrial physics (ISTP) programme launched in 1994 November. Wind and the polar satellite are NASA's contribution to the ISTP project. Wind investigates the sources, acceleration mechanisms and propagation processes of energetic particles and the solar wind. It will help to complete observations of the plasma, energetic particle and magnetic field influences on the magnetosphere and ionosphere. Wind was placed into an L1 halo orbit between the Earth and Sun via a lunar gravity assist swing-by. It is equipped with a suite of ten instruments provided by the USA, Russia and France. The Konus instrument was the first instrument from the former Soviet Union to fly on a US spacecraft. winonaite Subgroup of the achondrite meteorites. Winonaites are related to the silicate inclusions in certain iron meteorites and may derive from the same parent body. They are also described as primitive achondrites. Winthrop, John (1714-79) Colonial American scientist, professor of mathematics at Harvard University (1738-79), where he made long-term meteorological and sunspot observations; he gave Harvard its first telescope (1672). Winthrop correctly predicted the return of Comet halley in 1759 and made detailed observations of the apparition. He observed the transits of Venus in 1761 and 1769, organizing a successful expedition to Newfoundland for the earlier event. WIYN Telescope Highly innovative 3.5-m (138-in.) optical telescope at kitt peak national observatory, completed in 1994. It is owned and operated by the WIYN Consortium, which consists of the University of Wisconsin, Indiana University, Yale University and the national optical astronomy observatory. The telescope combines a spin-cast mirror (made at the steward observatory Mirror Laboratory) with a compact, lightweight structure and a low-turbulence enclosure. The WIYN telescope has only one-eighth of the moving mass of the nearby (and similarly sized) mayall telescope, built in 1973. W.M. Keck Observatory Major optical observatory operating the two largest single-mirror telescopes in the world. The identical 10-m (394-in.) instruments are located at an elevation of 4145 m (13,796 ft) at mauna kea observatory, Hawaii, and the facility has its sea-level headquarters at nearby Kamuela. Built with funding from the W.M. Keck Foundation, the observatory is operated jointly by the california institute of technology, the University of California and (since 1996) NASA. Construction of the first telescope, Keck I, began in 1986, pioneering the use of segmented-mirror technology in large telescopes. The mirror is composed of 36 hexagonal segments, each 1.8 m (72 in.) wide and 75 mm (3 in.) thick, under computer control to maintain a continuous reflective surface. The technique has since been widely adopted in, for example, the hobby-eberly telescope. Keck I began science operations in 1993 May, and was followed in 1996 October by Keck II. A large and varied suite of instruments has been developed for the telescopes, most notably an adaptive optics system that permits the Kecks' imaging cameras and spectrographs to achieve maximum efficiency. Also available is a mode that allows the two telescopes to be combined along with several 2.0-m (79-in.) outrigger telescopes, allowing high-resolution optical interferometry to be carried out. Wolf, Charles Joseph Etienne (1827-1918) and Rayet, Georges Antoine Pons (1839-1906) French astronomers who discovered a new class of high-temperature stars, now known as wolf-rayet stars. Rayet worked at the Paris and Bordeaux observatories and was first director (1879) of the observatory at Floriac, France. Wolf also worked at Paris, and it was there, while examining spectra of the nova that appeared in 1866 May, that he and Rayet noticed wide, bright emission lines (later identified with helium, carbon and oxygen) that they later found (1867) also in the spectra of three hot, luminous stars in Cygnus. Wolf diagram Plot of the number of stars within a given brightness range against apparent magnitude. The number of stars normally increases by about 250% for each decrease in the brightness by one stellar magnitude. However, if there is a dark nebula along the line of sight, then the observed curve will deviate from the theoretical one at some point. The apparent magnitude where the curves deviate may be used to estimate the distance of the nebula. For thin nebulae, the physical depth of the nebula may also be found from the magnitude at which the observed curve resumes its theoretical trend. Maximilian wolf first plotted the diagram. Wolf, (Johann) Rudolf (1816-93) Swiss solar astronomer who independently discovered the 11-year solar activity cycle by logging the numbers of sunspots that appear over this period of time. Director of the Bern Observatory (1847-55) and founder (1864) of the Zurich Observatory, Wolf related sunspot activity to geomagnetic storms on Earth. In 1849 he devised a way of accurately counting the number of sunspots and groups, formerly known as the Zurich or Wolf number (see relative sunspot number). Wolf, Maximilian Franz Joseph Cornelius ('Max') (1863-1932) German astronomer, who was a pioneer of astrophotography, discovering 232 minor planets and dark nebulae in the Milky Way. He was the long-time (1893-1932) director of Heidelberg's Konigstuhl Observatory. Among Wolf's asteroid discoveries were (323) Brucia, the first found photographically, in 1898, and (588) Achilles, the first trojan asteroid identified, in 1906. His star counts of his wide-field Milky Way photographs enabled him to map huge dark clouds of obscuring gas and dust. He discovered that planetary nebulae are gaseous shells. Before it was understood that the 'spiral nebulae' were other galaxies, Wolf obtained many spectra of these objects, showing (1908) that they were composed of stars. He observed and catalogued over 6000 nebulae and galaxies, including many members of the Coma and Perseus galaxy clusters; the majority of these objects were newly discovered. Wolf-Rayet star (WR star) Hot star that is experiencing high mass loss. The spectra of Wolf-Rayet stars show broad emission lines, making them easy to identify in spectroscopic observations, even at large distances. First recognized by the French astronomers Charles wolf and George Rayet in 1867, Wolf-Rayet stars are divided into three broad spectroscopic classes - WN, WC and WO. WN stars show emission lines predominantly of helium and nitrogen, although emission lines of carbon, silicon and hydrogen can be observed in some spectra. The spectra of WC stars are dominated by carbon and helium emission lines with no hydrogen and nitrogen. The more rare WO stars are similar to WC stars, with oxygen lines and lines of other elements showing high ionization. Wolf-Rayet stars have surface temperatures between 25,000 and 50,000 K, luminosities between 100,000 and one million times that of the Sun, and masses from 10 to 50 solar masses. The very high luminosities generate a radiation pressure that drives a wind of gas up to a rate of 10 solar masses in a million years. The average maximum velocity of material ejected from WR stars is 800 to over 3000 km/s (500-1900 mi/s). Wolf-Rayet stars demonstrate quite dramatically the effect that mass loss can have on massive stars. Their original hydrogen-rich envelopes have been stripped away to expose regions in which the products of nuclear reactions are present. The type of WR star that emerges after the mass loss depends on how far evolution had progressed before the hydrogen envelope was lost. Wolf-Rayet star The extremely hot star HD 56925 has ejected this nebulosity, catalogued as NGC 2359. Wolf-Rayet stars like HD 56925 show enormous rates of mass loss via stellar winds, and rapidly become unstable. Because of their spatial association with ostars, and their peculiar surface abundances, WR stars are believed to be descended from O stars. Around 50% of WR stars are found in binary systems. Many central stars of planetary nebulae are WR stars. About 220 WR stars are known in our Galaxy, but this is a lower limit because most WR stars are hidden from view by dust. One WR star is easily visible to the unaided eye: the 2nd-magnitude southern-hemisphere star 7 Velorum is a WC star with a spectroscopic binary companion of spectral type O7. Wollaston, William Hyde (1766-1828) English chemist and physicist who made some of the earliest observations of the solar spectrum. In 1801 he noticed five dark (absorption) lines in the solar spectrum, but misinterpreted them as boundaries between different colours. In 1814 Joseph von fraunhofer confirmed the existence of these features, and in 1859 Gustav kirchhoff correctly explained their nature. Wollaston was one of the first to observe ultraviolet light. He also invented the Wollaston prism, which is used in some polarimeters. Woolley, Richard van der Riet (1906-86) English astrophysicist who greatly advanced the development of astronomy in Australia. Woolley directed mount stromlo observatory (1939-55), acquired a 1.88-m (74-inch) reflecting telescope, at the time the southern hemisphere's largest. As England's tenth astronomer royal, he directed the Royal Greenwich Observatory (1956-71). Woolley's contributions spanned studies of the solar photosphere, chromosphere and corona; the measurement of stellar radial velocities; investigations of RR Lyrae variables and the stellar populations in globular clusters; and the determination of large-scale galactic motions. wormhole Connection of two black holes either from two locations in our Universe, or one from our Universe and one from another, separate universe. These black holes are connected by their singularities and theoretically can provide a bridge or shortcut from one location to another, or from one universe to another. 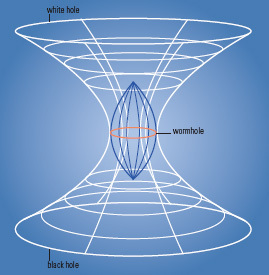 Wormholes are also called Einstein-Rosen bridges after the first physicists to consider the mathematical possibility of such connections as suggested by general relativity. wormhole This is a mathematical representation of the distortion of spacetime produced by a Schwarzschild wormhole connecting two universes via a black hole and a white hole. While predicted by Einstein’s equations, such wormholes cannot exist in reality, since the occurrence of white holes is forbidden by the second law of thermodynamics. Wright, Thomas ('Thomas Wright of Durham') (1711-86) English philosopher, instrument-maker, teacher and popularizer of astronomy. In An Original Theory, or New Hypothesis of the Universe (1750), Wright described the Milky Way as a flat disk of stars with the Solar System at its periphery, an essentially correct model. He also correctly described Saturn's rings as being composed of particulate matter. wormhole This is a mathematical representation of the distortion of spacetime produced by a Schwarzschild wormhole connecting two universes via a black hole and a white hole. While predicted by Einstein's equations, such wormholes cannot exist in reality, since the occurrence of white holes is forbidden by the second law of thermodynamics. wrinkle ridge Long, sinuous, narrow ridge. Wrinkle ridges are abundant on the plains of the Moon, Mercury and Mars; they are interpreted to be compressional tectonic structures. Wrinkle ridges are typically not more than a few hundred metres high, a few kilometres wide and tens to hundreds of kilometres long. On Earth wrinkle ridges are rare because of surface erosion. W Serpentis Eclipsing variable star with extremely unusual light variations, between magnitudes of about 8.9 and 10.3. The generally accepted period is 14.153 days. There appears to be an overlying longer period of about 270 days. In addition to the deep minimum, there are also two shallow minima and three maxima. The system consists of two stars of roughly the same size, but of different brightness, rotating inside a common envelope. From one of the components (of spectral class A or F) ejection of material is taking place. The system evolves rapidly and the period is increasing. One of the two stars itself may be an intrinsic variable. W Ursae Majoris star (EW) One of the three main subtypes of eclipsing binary. W Ursae Majoris stars exhibit continuously varying light-curves, with primary and secondary minima of identical or almost identical depth. They differ from beta lyrae stars in being smaller, less luminous stars of nearly identical brightness. The stellar cores are surrounded by a common convective envelope. W Ursae Majoris stars are contact binaries. They are thought to be possible precursors of dwarf novae and other cataclysmic variables. W Virginis star (CW) Type of pulsating variable star superficially similar to a cepheid variable. On the hertzsprung-russell diagram they typically lie in the spectral class range G0 to M0 and the absolute luminosity range Mv = —1 to —4; they are thus giant stars. Their masses could be as low as 0.5 solar mass, suggesting that they have evolved from low-mass main-sequence stars. They lie on the instability strip on the HR diagram, which goes from Delta Scuti stars on the main sequence through the RR Lyrae stars and Cepheids to the irregular variables and Mira stars; therefore the cause of their variation is thought to be the same, that is, a layer of ionized helium within the star. W Virginis stars may be distinguished from classical Cepheids by the less-regular shape of their light-curves and the double-peaked nature of their maxima. Their periods range from approximately one day to 100 days and their period-luminosity law is distinctly different from that of the Cepheids. They do not form a homogeneous group: some belong to Population I and some to Population II. Occasionally W Virginis stars show small period changes. RU Camelopardalis, however, is a remarkable case: its variations suddenly stopped in 1964 for about three years. The spectral type of RU Camelopardalis (KO to R2 with excess carbon) is later than usual for W Virginis stars, but the star is otherwise unremarkable. It is not understood how pulsations can stop, or start, in such a short time. Because these stars are brighter than the RR Lyraes, but fainter than the Cepheids, and have a well-defined period-luminosity relationship, they may be used to estimate distances for galactic and extragalactic objects. WZ Sagittae Star, originally classified as a recurrent nova, that has many similarities with the ugeminorum dwarf nova class; it may be a link between the two types. Four outbursts have been observed, in 1913, 1946, 1978 and 2001. It is also an eclipsing system, with a period of 81.5 minutes. The light-curve at eclipse resembles that of a w ursae majoris star. WZ Sagittae is normally around magnitude 15.5 at minimum, but has reached 7.0 during an outburst. Possible masses of the components are 0.59 and 0.03 solar mass.